What FOURS feels about Private Unrecognized Schools..
Can we afford to go to recognised schools? Schools cannot gain recognition overnight. It is a steady process involving time and resources. Every Recognized school has to pass and struggle through the initial hiccups and eventually gain recognition. Obviously all Recognized schools will admit this fact. Most of the unrecognized schools cater to the lower strata of the society. This means education is being imparted to underprivileged children as well. All, at an affordable fee structure. Most slum dwellers and people living below and slightly above the poverty line cannot afford to join their wards in recognized schools, which charge hefty admission fees and other terminal fees. Amounting to literally fleecing the students. Not every recognized school has competent staff and infrastructure and which is by no means superior in any way to unrecognized schools. Unrecognized schools must be given a chance to apply for recognition and up gradation with a definite grace period. 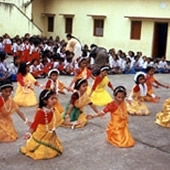 The minimum strength of a school cannot be determined in the initial years of its setup. There is very less distinction between UNRECOGNIZED SCHOOLS and RECOGNIZED SCHOOLS in smaller localities and slums in terms of standards and infrastructure.